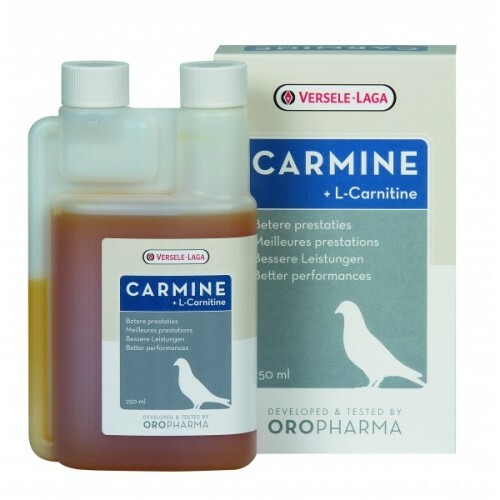 Carmine + L-Carnitine by Oropharma - Versele Laga is complementary feed for pigeons. Oropharma Carmine is a liquid carnitine preparation enriched with vitamins, amino acids and choline. It improves performance, gives extra energy and ensures higher and better production of crop milk. Carmine is a balanced solution of amino acids and vitamins, supplemented with L-carnitine and choline. L-carnitine provides the mitochondria, the energy producers of the body, with sufficient nutrition for the production of extra energy. Choline has a central function in the regulation of the metabolism of fat. Through an optimised metabolism of fat the pigeon produces more crop milk of better quality. The administration of Carmine causes less lactic acid to be produced in the muscles and the pigeon suffers from fewer cramps. The waste products produced are discharged more easily. 1 measure (10 ml) of Carmine per litre of drinking water. Short distance: during 3 days before basketing. Middle distance: during 4 days before basketing. Long distance: during 7 days before basketing.